As part of an ongoing project to restore a World War II fighter plane, ShapeMaster used non-contact digital scanning to scan a part from the plane's engine. It then 3D printed a replica of the part that can be investment cast in the appropriate metal. During the printing, ShapeMaster repaired the corrosion damage so that the 3D printed part looks and measures identically to the original. Photo courtesy of ShapeMaster Inc., Ogden,Ill. ShapeMaster Inc., an Illinois-based specialist in vacuum forming, thermoforming, and CNC machining, demonstrated its expertise in 3D printing in an on-going restoration of a World War II fighter plane, a Messerschmitt BF 109, that saw action in World War II in the Soviet Union. Kenneth B. Cooley, Jr., company president and founder, said ShapeMaster Inc., was approached by Midwest Aero Restorations Ltd., with a challenge to recreate a motor part from the 1930s-era Messerschmitt BF 109 that had been submerged in water after being shot down in the Soviet Union. The part was not only about 75 years old, it was corroded. Cooley founded ShapeMaster Inc., in 1990, and today it employs 18 people operating in a 13,000-square-foot factory in Ogden, Illinois. In 2017, ShapeMaster added a DM-1 Haas Mill for increased speed and precision. The company also added metal welding equipment to offer metal welding in house. Online sources estimate there are only 67 ME 109f airplanes in existence from World War II. Airplanes used in the films "The Battle of Britain" and "Tuskegee Airmen" came from Spain and were manufactured after World War II. Cooley said the airplane being restored in Illinois is in pieces with some parts in the United States, some parts in England, and some parts in Germany. One criterion of the restoration was that the fighter never fought U.S. troops, and this one flew in the Soviet Union until it was shot down and then hidden in a lake. The entire job is expected to cost $10 million. ShapeMaster (www.shape-master.com) scanned the motor part and created a CAD file using SolidWorks. 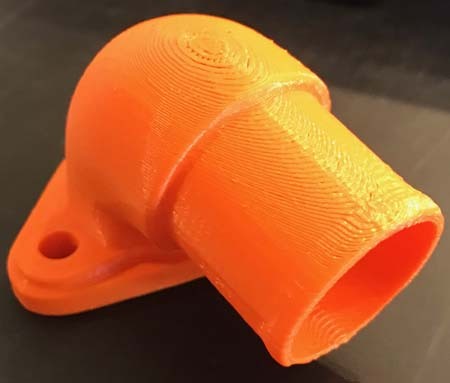 The firm then 3D printed a replica of the part that can be investment cast into the appropriate metal for the engine part. During the printing, ShapeMaster repaired the corrosion damage so that the 3D part looks and measures identically to the original. Then ShapeMaster went to work on a second part. "We also took the scanner out and scanned the wing," Cooley said. Workers with another firm had been attempting to replicate the ribs inside the wing that give it its shape. Cooley's team, using scanners and other computer technology, showed the customer they could recreate the ribs by scanning the outside of the wing, instead of going through the labor-intensive step of dismantling the wing and measuring everything. "We used the scanning technique and brought them a rib that fit perfectly," Cooley said. The restoration process is designed to restore the plane to flight, not for simple cosmetic purposes. The Messerschmitt BF 109 was the most manufactured fighter aircraft in history. It was the main fighter used by Germany in World War II, and was first flown in war during the Spanish Civil War in 1937. Germany flew it until the end of the Second World War in 1945. The restoration company, Midwest Aero Restorations, is a specialist at restoring P-51 Mustangs, which were flown by the English and United States during World War II. It first flew in 1940 and was introduced by the Royal Air Force in 1942. It was last flown by the Dominican Air Force in 1984. Half as many Mustangs were made than the Messerschmidt 109s. "There are very few of these that are flying," Cooley said. "It will fly."